Diaspora and Armenia will be without a representative for the finals of the Australian Open, the first of this year's ATP Grand Slams. Marat Safin (unseeded of Russia) put out defending champion Andre Agassi (USA, seeded No. 4) in today's semifinal in Melbourne (7-6, 7-6, 5-7, 1-6, 6-3). The match lasted three hours, 42 minutes. David Nalbandian of Argentina left the competition earlier when in a quarterfinal match he lost 5-7, 4-6, 7-5, 3-6 to the second best player at the tournament Swiss Roger Federer. 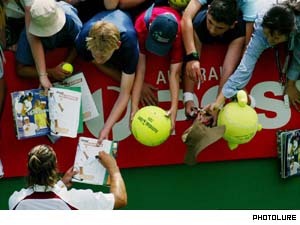 Nalbandian collected 50 race points at the tournament and earned $150,000. Andre Agassi meanwhile collected 90 race points and earned $300,000 for reaching the semifinals. Sargis Sargsyan from Armenia was knocked out by Todd Reid (Australia) in the second round of the competition, however, he didn't leave Australia. Sargsyan teamed with Karsten Braasch of Germany for continuing his participation at the tournament in Men's Doubles category. The pair reached the third round where they lost 5-7, 2-6 to Argentinean double seeded 9 Gaston Etlis and Martin Rodriguez. Wednesday was Army Day, marking the 12th anniversary of Republic of Armenia's forces. President Robert Kocharyan and government dignitaries visited a Yerevan military cemetary to pay respects.